"It would be a strange situation if Wales was part of a UK that also consisted of England and Northern Ireland but not Scotland. Would Wales send a mere 30 MPs to sit alongside 502 English counterparts? 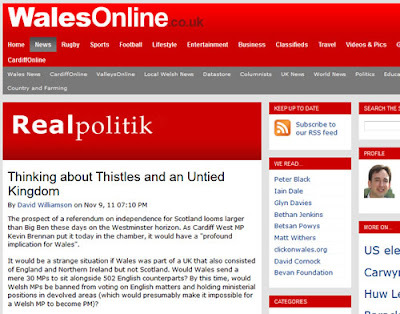 By this time, would Welsh MPs be banned from voting on English matters and holding ministerial positions in devolved areas (which would presumably make it impossible for a Welsh MP to become PM)?"